Nutrition Systems is the leading distributor of sports nutrition in Australia and New Zealand. For the past 20 years, Nutrition Systems has been importing and distributing the highest quality sports nutrition from the USA with a focus on the most innovative and effective products. Nutrition Systems represents the world’s leading brands including BPI Sports, Cellucor, MuscleTech, MusclePharm, ProSupps, Prime Nutrition and Quest Nutrition with the commitment to extensive and ongoing product research & development with its suppliers. Nutrition Systems provides full market coverage with over a thousand customers spanning Australia, New Zealand, Singapore and other parts of Asia. Nutrition Systems services customers of all sizes including national grocery chains, mass market, specialist sports nutrition retailers, health food stores, pharmacies, gyms and sporting clubs. Our customers are serviced by a nationwide sales force of experienced in-field Account Managers and in-house Customer Service Representatives together providing unrivalled customer service, product training, merchandising and promotional support. Nutrition Systems is the largest media buyer in the sports nutrition industry and provides extensive advertising every month in leading health and fitness publications. 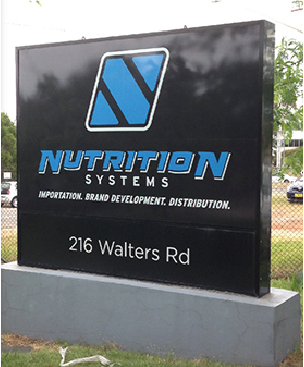 With over 9,000m2 of distribution facilities in Australia and New Zealand, Nutrition Systems has established a highly efficient distribution network with next-day delivery to most customers. All orders are processed same day and delivered to customers using leading logistic providers. Nutrition Systems also maintains a professional internal and external Compliance team dedicated to ensuring product safety, efficacy and compliance. Nutrition Systems also currently sponsors more than 40 therapeutic products with the Australian TGA. Nutrition Systems operates at the cutting edge of the sports nutrition industry and is committed to providing outstanding sales growth to both its customers and suppliers.